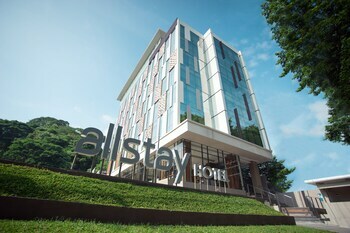 Located in Semarang, Allstay Hotel Semarang is within a 5-minute drive of Ciputra Mall Semarang and Diponegoro University. Featured amenities include a 24-hour front desk, luggage storage, and laundry facilities. Free self parking is available onsite. With a stay at Magnolia Boutique Hotel in Jakarta (Old Jakarta), you'll be within a 10-minute walk of Old Town and Lokasari Plaza. Free self parking is available onsite. With a stay at RedDoorz @ Jalan Bangka in Jakarta (Kebayoran Baru), you'll be close to Block M Square and Gelora Bung Karno Stadium. Free self parking is available onsite. With a stay at RedDoorz @ Gatot Subroto in Bandung (Lengkong), you'll be minutes from Rumentang Siang and close to Kampung Naga. Featured amenities include a 24-hour front desk and luggage storage.